Must be cooked in my rice cooker — I have a Zojirushi with a porridge setting and it makes the perfect bowl of oats every time. Must be steel-cut oats not rolled. My personal preference is for the chewier texture of steel cut oats. I often use King Arthur’s Pompanoosuc Porridge which is a mix of steel-cut oats, flax and flax-seed, and bulgur. I’ve wanted to try to make my own mix like this but just haven’t started experimenting yet. Must be made with 1/2 water and 1/2 non-dairy milk. In the rice cooker this means 1/2 cup of oatmeal to 3 cups of liquid; so I use 1 1/2 cups water and 1 1/2 cups non-dairy milk, my favorites are almond and chocolate soy milk. Must contain at least 1 fruit – – fresh or dried. If dried I keep it to 1/4 cup. Adding fruit allows the oats to become quite sweet without additional sweetener. Must contain 1 tablespoon of chia seeds. These tend to swell and give the oatmeal almost a pudding consistency. Chia seeds have properties that slow the conversion of carbohydrates into sugar. Must be topped with nuts or nut butter, or granola for crunch. 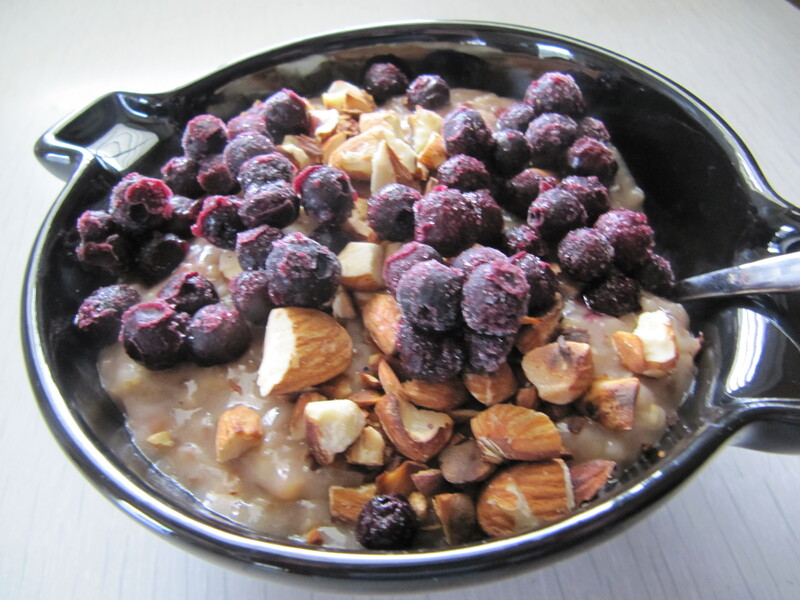 This morning I made AABBCC Oatmeal – – which is Almond Apple Banana Blueberry Cherry Chia Oatmeal. Delicious as usual and the bonus part was I started it cooking in the rice cooker then left the house to go watch D play hockey and when I got home it was cooked and kept warm for me. 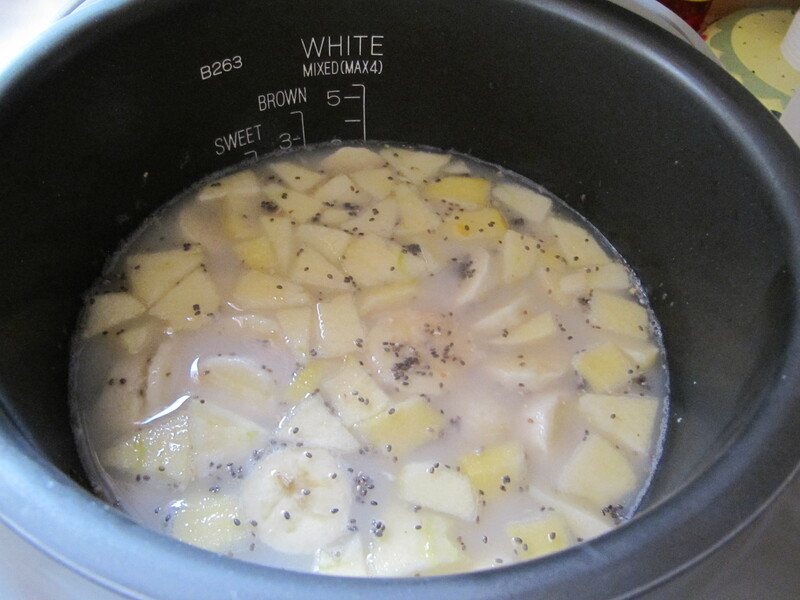 Apple, banana, chia, and dried cherries added prior to cooking. Remember the Amazing Mumford; the Sesame Street magician who performed magic with the words “Ala peanut butter sandwiches”? I still use that phrase when I come upon something particularly magical, like making oatmeal in a rice cooker and have it magically appear for breakfast, piping hot just exactly when you’re ready for it. 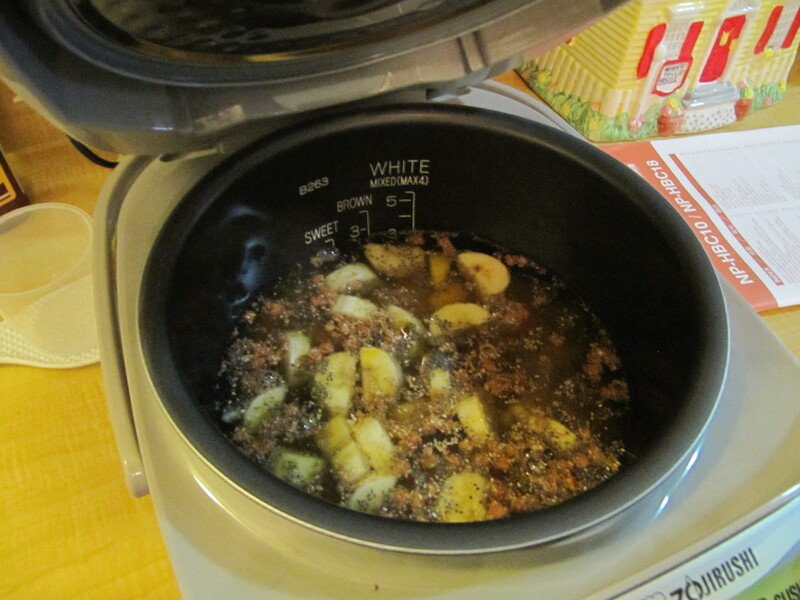 I love that I can dump everything into my Zojirushi rice cooker, set the timer for when I want it to be done and then go to bed, get up, go to the gym, shower and voila…ala peanut butter sandwiches, breakfast is served. I made enough for N and me for breakfast and an extra serving for one of us tomorrow morning. 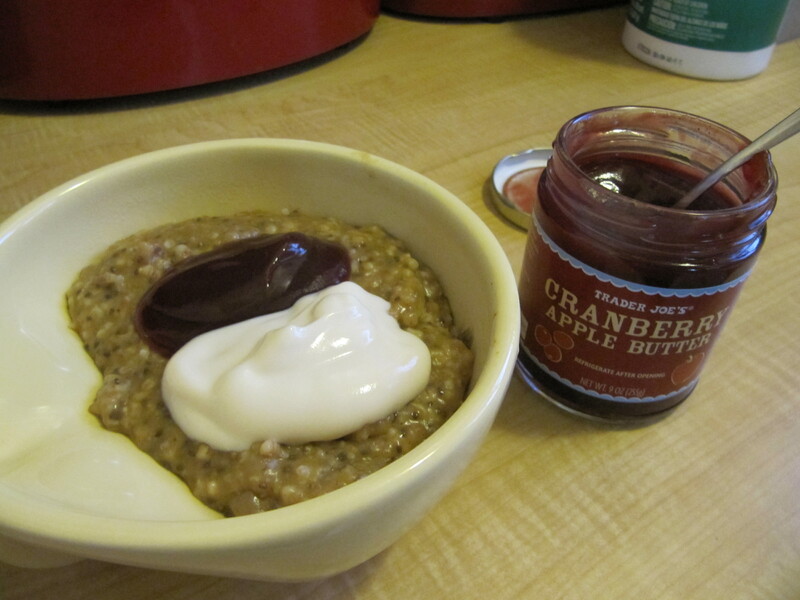 This morning it got served up with a dollop of Cranberry Apple butter from Trader Joe’s, another of soy yogurt, and a sprinkle of toasted pecan bits. It was awesome. Too bad it was hotter than blazes today. The Santa Ana winds have arrived bringing the last hurrah of summer and a flurry of sneezing! This morning, that dollop of yogurt looks bigger than I remember and clearly I sprinkled the pecans on after I took the picture. 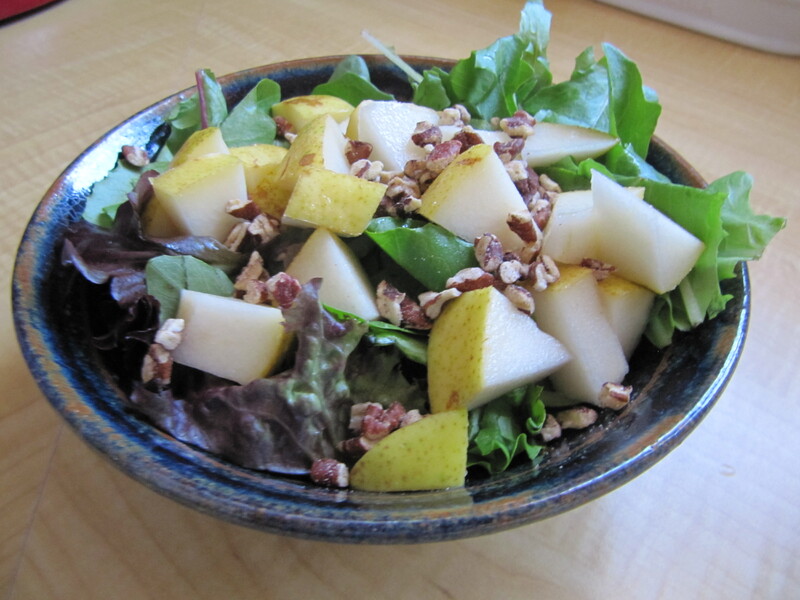 And for lunch a beautiful pear and greens salad with another sprinkle of pecans. This time you can see them.